These pontoon boat seats make up our Premium CFG45 pontoon furniture set. Our 38" pontoon boat seat with a 7" arm rest will weight 75lbs total. The 38" seat weighs 65lbs and the arm rest weights 10lbs. Unfortunately, we only offer our seats with the plastic bases included. These come with a standard 8" radius on the corners of the seats. Are the bases included in this price? Yes, the bases and cushions are sold together as a set for the prices listed. Do the arm rest come attached? Are the corners rounded for the curve of the boat? No these arm rest comes separate from the other seats. You will need to attach them to the seat you would like them to sit against. 1. How what are the inside storage dimensions? 2. Not clear on why you say 45" min. to install. Wouldn't you need 90" min? Or, if you just were getting the seats, wouldn't that change the min? 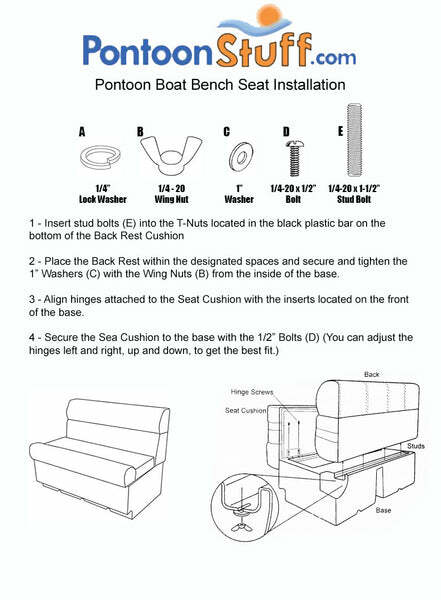 If you are purchasing the Pontoon Boat Seats, you would need 45" minimum because a 38" Bench plus a 7" Arm Rest Equals the 45" minimum required. Inside the plastic base in 36" wide on the inside and 25" in depth. There is a lip that the seat cushion will sit on.